Good news for Atom. Bad news for Core? IDF Worldwide shipments of mobile computers will match those of desktops this year - and it's all thanks to the Asus Eee PC and its ilk. So said Intel mobility chief Dadi Perlmutter yesterday at the chip giant's bi-annual Developer Forum. But while that's good news for the Atom chip family, it's less pleasing for the folk behind Intel's Core chips. Intel has already forecast that laptop sales will exceed those of desktops in 2010, and Perlmutter re-iterated that prediction. Next year, sales of the two formats will be neck and neck. What's changed is the arrival of what Intel calls "netbooks" - low-cost mini laptops primarily intended for using the internet. Asus' Eee PC was the first, but since its release in the autumn of 2007, plenty of others have come along. Dell's long-awaited version, now though to be called the Inspiron 910, may even come out this Friday. Whether it does or not, Intel reckons 2008's netbook shipments will be sufficient to lift the total number of mobile PCs shipped this year to match the desktop total, a year ahead of expectations. Intel's arguably saying so to promote its Atom processor, as its chart shows - don't forget, plenty of netbooks will be based on other company's chips, like VIA's C7-M and, possibly, Nano, not to mention Intel's own Celeron M series, which Asus is still using in some of its latest Eees. 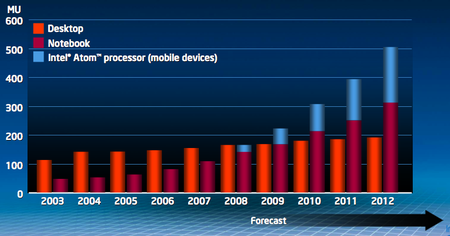 Come 2011, and the contribution made by netbooks will lift the shipments of mobile PCs to double those of desktops. Assuming regular laptops are primarily Intel-powered by then, Intel's chart indicates more than a third of the chip giant's own mobile processor shipments will be Atoms. Since its Atom processors are cheaper than its Core products, that may not be good news for the company's revenues. The growth trajectory marked by mobile shipments in 2003 through 2008 suggest that Atom will cannibalise a fair few sales that would have gone to Core. At least it's not forecasting a downturn in desktop demand, with shipments continuing to grow - just about, at any rate - through 2012.